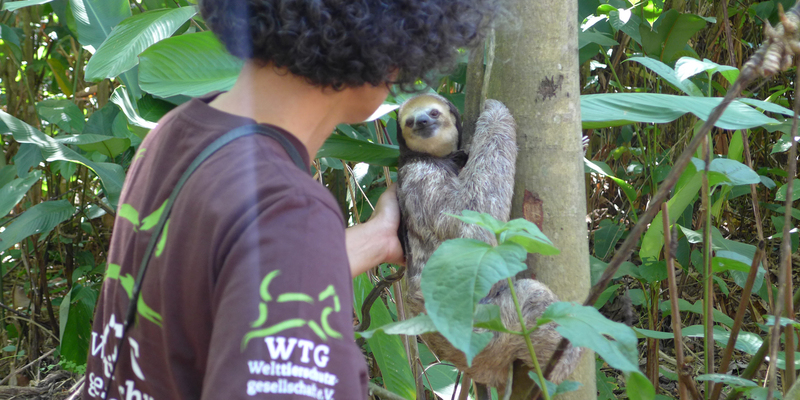 Wildlife in Suriname - Welttierschutzgesellschaft e.V. 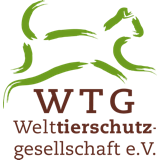 Welttierschutzgesellschaft (WTG) supports Suriname’s first and so far only wildlife protection centre for the rescue, care and release of wild animals. More than 90 percent of Suriname is covered by untouched rainforest. But the apparent paradise for the South American country’s fauna is threatened. Due to increased deforestation the natural habitat of numerous wild animals is destroyed and increasingly often, wild animals are found disoriented and injured in the cities. Whether we are talking about sloths, anteaters or armadillos, all of them are threatened by the deforestation of Suriname’s tropical rainforest. These animals can hardly stand a chance to adapt to the rapidly changing environment. Furthermore, these changes cause numerous new dangers for them. Sloths are a particularly obvious example. They spend nearly their whole live in trees. There, they sleep, eat, mate and give birth to their young. Because of their nutrient-poor diet, which almost entirely consists of leaves, their metabolism is particularly slow. As a result, the animals’ movements are extremely slow. 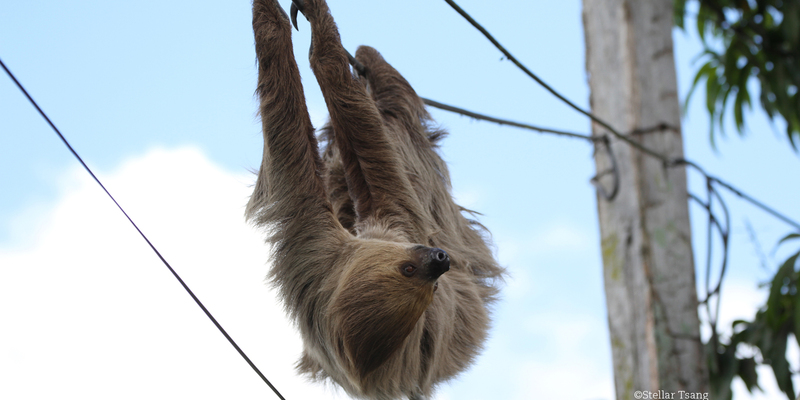 While on trees, sloths are capable of defending themselves against raptors, feline predators, and other natural enemies using claw heaves, but they are powerless against the dangers humankind is bringing upon them. When the loggers arrive, they are incapable of fleeing. 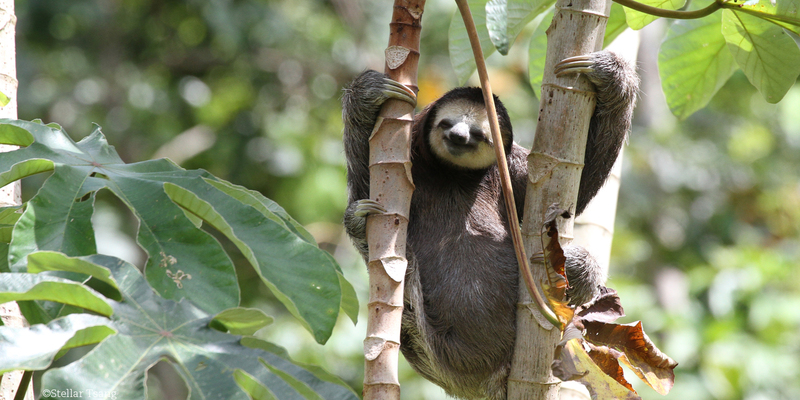 On the ground, sloths slowly drag themselves along with their long arms, which leaves them entirely unprotected. In Suriname, the number of animals in need increases. They are found disoriented or have been critically wounded due to road traffic accidents or accidents with electricity lines. Species-inappropriate keeping of wildlife is also an issue. Many people like to keep wild animals as pets overlooking that they cannot provide proper living conditions. Together with our partner organisation, Green Heritage Fund Suriname (GHFS), we are active on behalf of these animals. The GHFS team regularly moves out to provide help for lost or injured animals and free them from bad keeping conditions. Using a specifically equipped vehicle staff members rescue the animals from their unfortunate situation. In the only wildlife rescue centre in the country, medical treatment and species-appropriate care is provided. This is located far from the city, right on the edge of the rainforest and offers nature-oriented enclosures. There the animals can not only recover but also prepare themselves under observation for the reintroduction into the wild. As soon as their condition allows it they are released into safe forest grounds that are far from the nearest city and not at risk of deforestation. 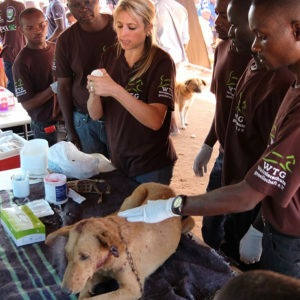 Since the foundation of the GHFS in 2005, their staff members have rescued more than 600 animals. Whereas in 2014 on average they took in one animal per week, due to increased deforestation in and around Paramaribo, in 2015 that number tripled, and it is continuing to rise. Raising awareness for ecological issues among locals is crucial if we want to be successful in the long term. Therefore, we support educational programs. In the course of school visits and information events and through the use of flyers and posters the GHFS’s staff provides information about the responsible use of natural resources and the direct impact on local wildlife. 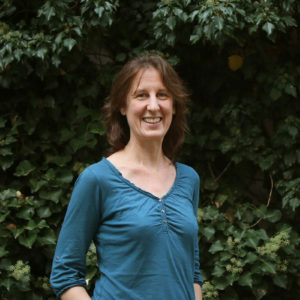 Educating the public about the fact that wild animals belong in the outdoors and are not fit for a life as pets is another central aspect of their educational work.